Pietersite, Carnelian and Tiger Eye bracelet, necklace and close-up of necklace. 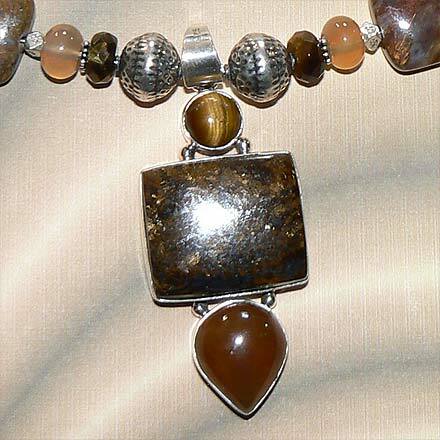 Sterling Silver Pietersite, Carnelian and Tiger Eye Necklace. 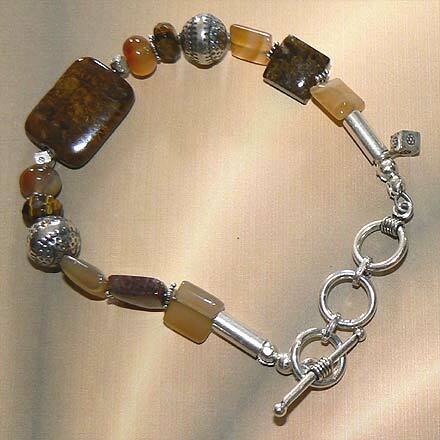 Sterling Silver Pietersite, Carnelian and Tiger Eye Bracelet. A variety of golden bronze and orange glows come from these stones, with the strange mottled qualities of Pietersite, the sheen of Tiger Eye and the inner warmth of translucent Carnelian. For those who are interested in Astrological significances of stones, Tiger Eye corresponds with Capricorn and Carnelian corresponds with Taurus.